Fugitive Projects 60 Second Southern Video Project will be screened at the grand opening of Ditch Projects in Springfield, Oregon on Thursday, November 6th and Saturday, November 8th 2008 at 8PM. This new venue is operated by graduate students and faculty from The University of Oregon’s Department of Art. Former Fugitive Projects collaborator Rob Smith is a Digital Arts MFA Candidate in the Department and one of the operators of this new space in an old Oregon mill. Fugitive Projects was invited by SEED to participate in BIN, exhibiting at AVA in Chattanooga, January 2009. SEED is an art collective in Chattanooga, TN. The motivation for BIN comes through a need to address the historical marginalization of artists and methods for overcoming this scenario. Each collective involved in this project is a vital model for alternative pathways, invention, action, and interdisciplinary approaches to making. This project is not predetermined. Instead of formulas, conventions, expectations, and objects – SEED is working with online relationships, and local negotiations.SEED is pleased to announce the participation and/or contribution by some fantastic collectives including Basekamp(Philadelphia), BLW, Common Places Project(Tampa), DeadTech (Chicago), Fugitive Projects (Nashville),Graffiti Research Lab (New York), Guerrilla Girls, InCUBATE-Chicago (Chicago), Mess Hall (Chicago), Paintallica(Washington), RTmark, TEAM LUMP (Raleigh), 6+ , andThe Yes Men. A reception is scheduled for February 6, 2009. Other programs will be announced as more information is available. AVA Center is located at 30 Frazier Ave. Chattanooga TN, 37405 and can be found at http://www.avartists.org. SEED bins going out to collectives. FUGITIVE PROJECTS ANNOUNCES AN OPEN CALL FOR VIDEO WORKS ON RHIZIME.ORG . THIS CALL CLOSES ON NOV. 20, 2008 AND IS FOR FUGITIVE VIDEO PROJECT 2009. The 60 Second Southern Video Festival will be screened at The Banff Center’s New Media Institute during a week long new media summit in Alberta, Canada called The Interactive Screen 0.8: Sustain. The 60 Second Southern Video Festival will play in Dublin at D.E.A.F: Dublin Electronic Arts Festival, October 22-27, 2008. Dominic DeJoseph’s Ghost Ray was in the 60 Second Film Festival. This same short was juried into the 2008 Cannes International Film Festival. Dominic’s resume includes working with REM and Wim Wenders and has shown at The Tribeca Film Festival, The Documentary Channel, South by Southwest, Montreal Film Festival as well as many others. 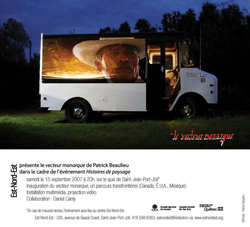 Fugitive Projects hosted 2 events with Canadian artist Patrick Beaulieu . At Watkins College Patrick was joined by artist Bill Daniel and his new program, Sunset Scavenger. Watkins College: Both Patrick Bealieu and Bill Daniel will present their vehicular project projections and installations. Oct 10, 2007 at 6:30 pm. University School Nashville: Patrick Bealieu presented his Monarch Vector Project on the Oct. 11th, 2007 twilight. The Monarch Vector Project is a multimedia mobile observatiory that Beaulieu uses to follow the migration clouds of monarch butterflies from Canada to the mountains of Mexico. 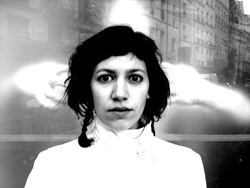 Texas born artist Bill Daniel will be exhibitiong a mobile outdoor video installation titled Sunset Scavenger. A 1965 Chevy sailvan schooner serves as Daniel’s tour vehicle, projection screen, and metaphorical emergency escape craft. His artwork functions as a modern-day survival guide to cope with economic and ecological disater. Fred Clarke, a former feature photographer from the Nashville Banner, is an award-winning international documentary photojournalist contracted by the International Committee of the Red Cross to document civilian populations caught in the crossfire of armed conflict. He has spent years in war-torn areas such as Azerbaijan, Bosnia, Chechnya, Lebanon, Liberia, and South Africa. Pressing Pause is an invitational response to Clarke’s work curated by Zeitgeist gallery and artists from Fugitive Projects. After leaving the Banner several years ago, Clarke focused his direction concentrating solely on capturing humanitarian images in conflict and post-conflict situations. This exhibition is an effort to make the struggle of these individuals and families whose lives have been put on indefinite hold less abstract than it is portrayed by our mainstream media. Fred Clark, Patrick DeGuira, Terry Glispin, Bryan Hunter, Pradip Malde, Richard Mitchell, Melody Owen, Lesley Patterson-Marx, Kevin McCoy, Greg Pond, Bert Rodriguez, Jack Dingo Ryan, Hans Schmitt-Matzen, Donna Tauscher, Lain York. Fred Clarke and several artists from Fugitive Projects will give a gallery talk at Zeitgeist Thursday evening, February 15th, 2007 from 6-8PM.